This sterling affirmation of liberalism is as relevant in the 21st century as it was when first published in 1964. A minister for more than fifty years, Mendelsohn examines the distinguished roots of Unitarian Universalism and the underlying factors that have drawn many leaders to this faith. The 2006 edition features a fresh introduction by the author and a foreword by Reverend Scotty McLennan, dean for religious life at Stanford University. What Do You Say After You Say “I’m a Unitarian Universalist”? Christian or More Than Christian? 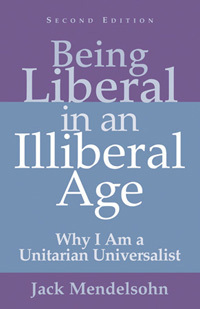 Being Liberal in an Illiberal Age was first published more than forty years ago. In the midst of the civil rights era, the country was also coping with the loss of President John F. Kennedy and facing the growing divisiveness of the war in Vietnam. Parts of the book were updated as late as 1985, when Ronald Reagan was one year into his second term. But the concerns of the book, liberalism and liberal religion, have never been more seriously challenged than they are today, in post–September 11, post–Patriot Act America. If we ever needed a wake-up call to our better democratic nature, we need it now. The natural liberal bent is to want people to live, not die, for their beliefs, but both liberals and moderate conservatives are now the objects of extreme hostility from the radical right, both in religion and politics. The dawning years of the twenty-first century have been a disaster for liberal religious values. After September 11, there seemed to be no way to stem the tide of vengeance. The terrorist attacks provided an emotional justification for an administration already committed to a neo-conservative ideology, emboldened by an evangelical and born-again brand of fundamentalist Christianity, and allied to the very military-corporate complex President Eisenhower warned against in his farewell address. Liberal values, religious and secular, were eclipsed by the shock and awe of the war in Iraq. Our leaders played on our fears instead of our ideals with false claims of weapons of mass destruction and collusion with terrorists. Liberal values were swept aside by deliberate budget policies that reward those with the most wealth with yet more, by an assault on seventy years of hard-won social programs, a vast national spying network and torture endorsed by our Justice Department, a denial of the constitutional wall of separation between church and state, and assaults on the scientific community with the promotion of “faith” concepts of creation and conception.